Saturday Morning, November 10, 2007 SOLD! 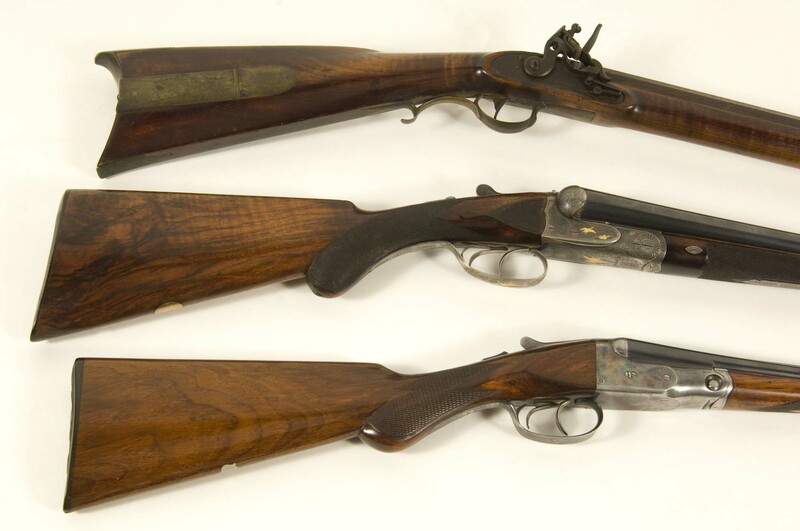 Fine Antique and Post-1898 Firearms at 10:00 a.m.
Old Coins, Currency and Stamps at Approximately 10:20 a.m.
And Estate Antiques at 12:00 Noon. From 8:00 a.m. to the Sale of Each Category on Saturday or by Appointment. 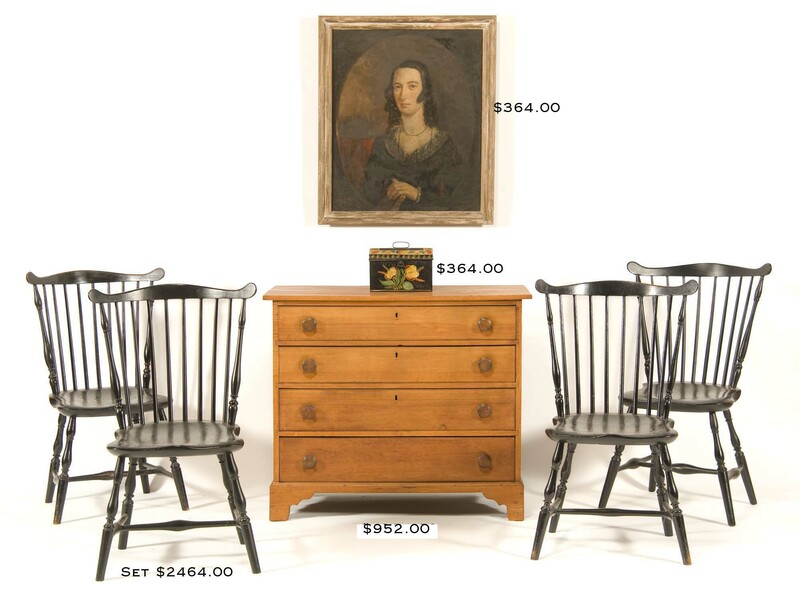 Offering a diverse selection of antiques and decorative furnishings removed solely from New England and East Coast private collections, estates and old households. 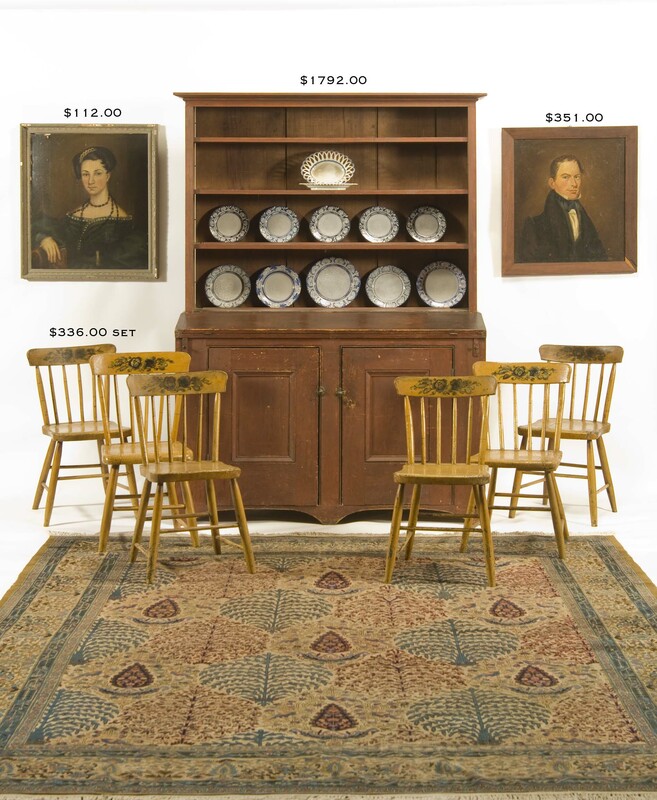 EARLIER FURNITURE: From a North Shore, MA family, a rare set of four bulbous-turned fan back Windsor side chairs with the brand, I. C. Tuttle (James Chapman Tuttle, Salem, MA). 40 in. bowfront mahogany chest on ogee base. 39 in. curly maple graduated four drawer chest on bracket base. 37 in. round Queen Anne drop leaf table on pad feet. 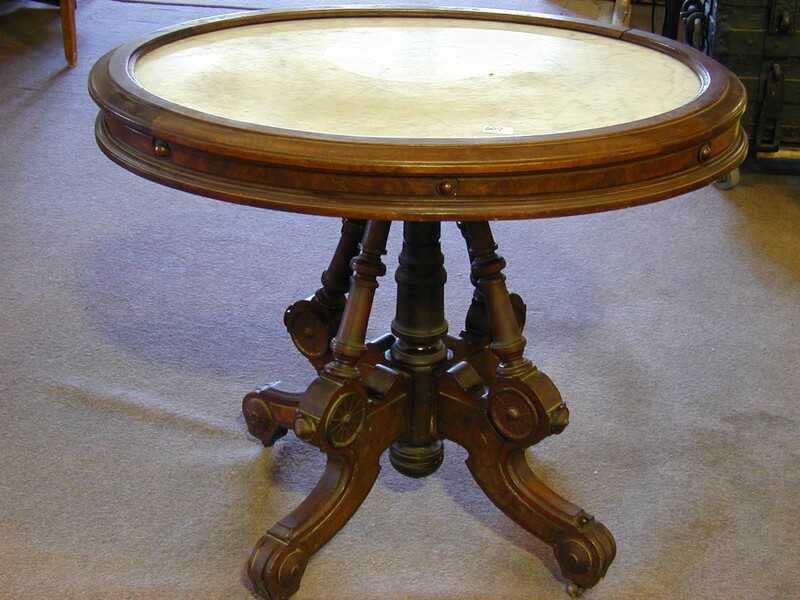 Other round and rectangular Queen Anne drop leaf tables. Reeded leg N.E. 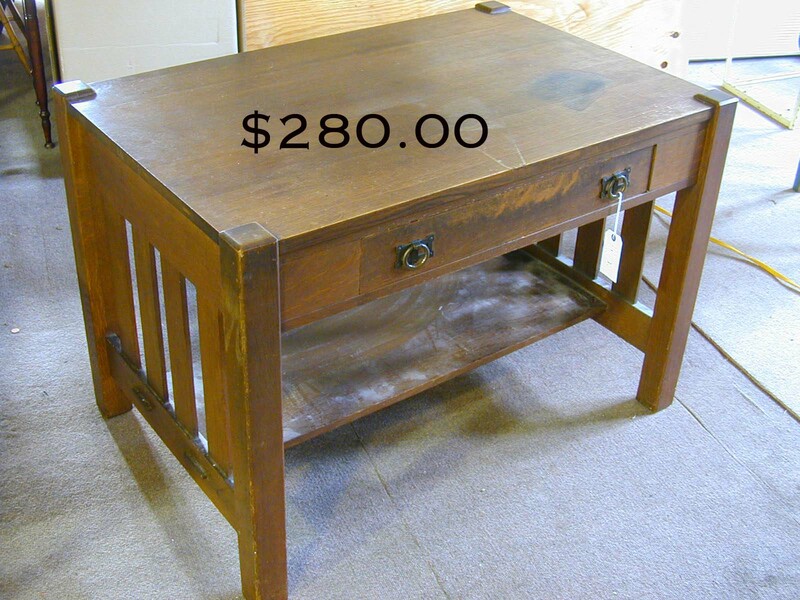 mahogany sewing table with bag. Other good stands and work tables. 40 in. maple slant front desk on high bracket base. Hepplewhite mahogany chest. Tapered leg mahogany Pembroke table. 48 in. 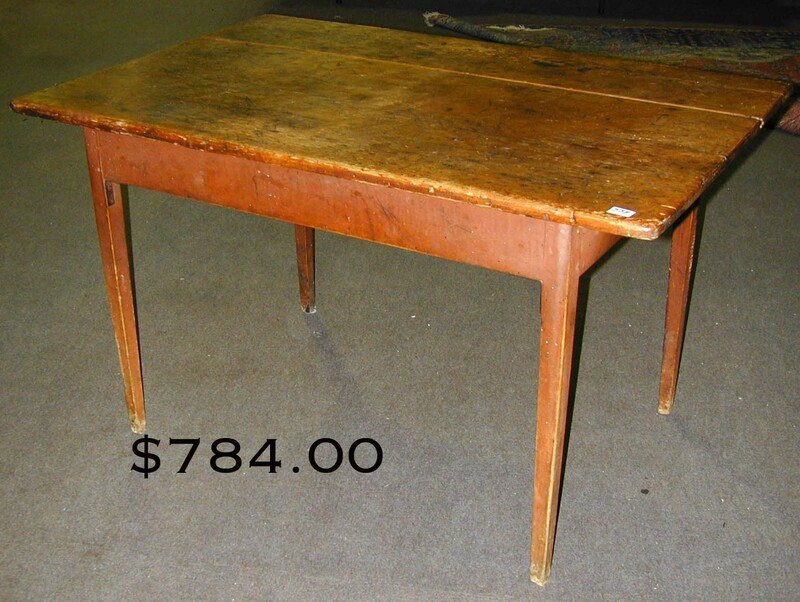 square leg Chippendale drop leaf table with cut corners. 47 X 31 in. tapered leg tap table on old red base. 55 X 79 in. old red 19th c. stepback cupboard from early York, ME home. 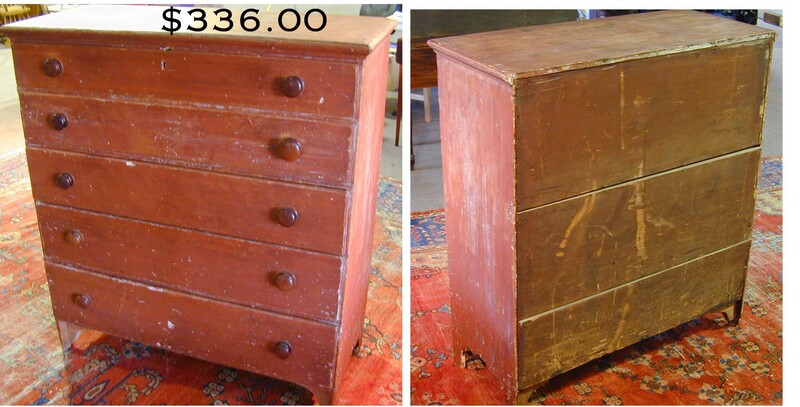 Graduated five drawer old red tall chest. Red and black grained drop leaf table. 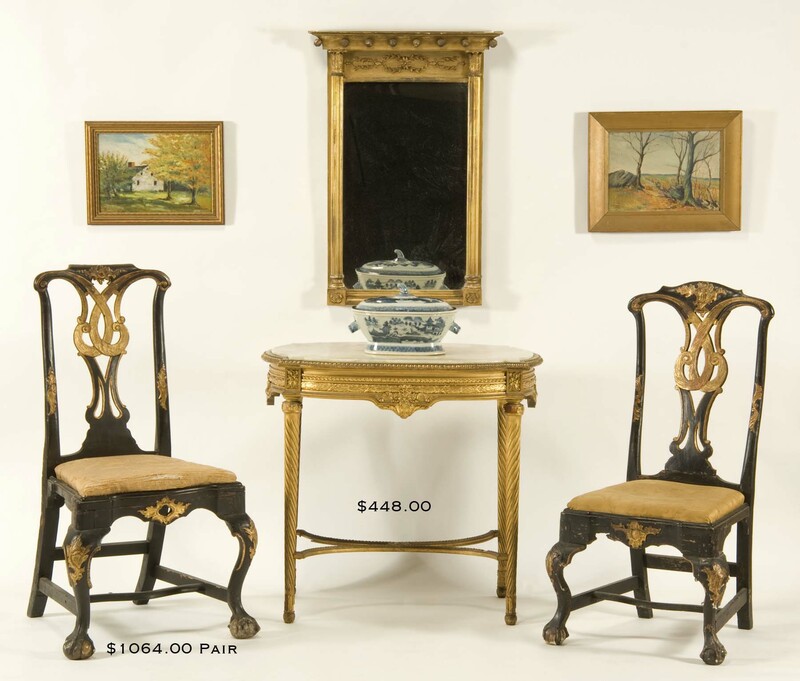 Three 18th c. Italian gilt-decorated side chairs. Early 19th c. Wm. and Mary style gateleg table. Pairs and single N.E. Chippendale side chairs. Chippendale, Earps of Phila. and tabletop dressing mirrors. 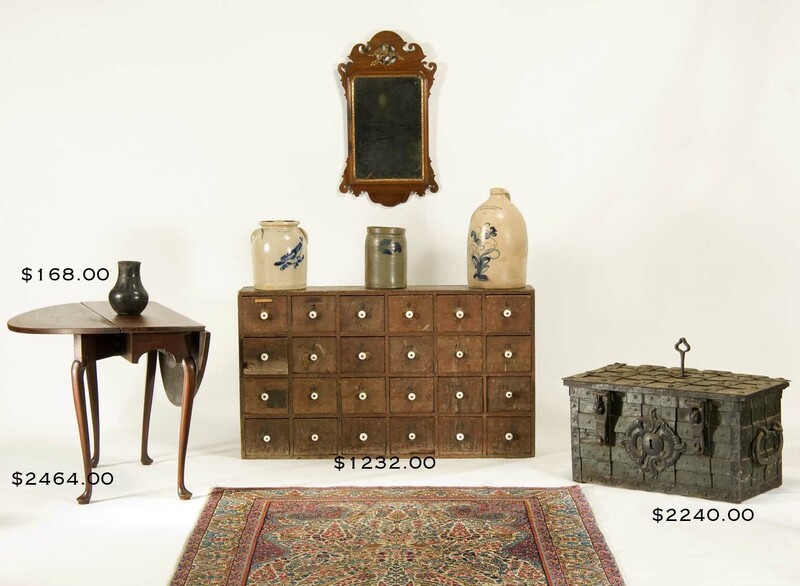 24 drawer old red apothecary chest from the private collection of noted collector, Norman Flayderman. Daniel Stewart labeled country comb-back rocker. Country stepback and flat front cupboards. Good turned post PA rope bed and others. Early banister back, heart and crown and ladderback side and armchairs. Set six decorated mustard grange chairs. Tripod candlestands. Numerous good blanket and storage boxes in old paint. PA poplar two door cupboard over drawer. 17th c. iron Armada chest. VICTORIAN FURNITURE: Gilt-trimmed walnut pier mirror on marble top base. Other stately mirrors. Stylish six drawer burled lockside chest with carved crest. Mahogany tabletop music box. French style oval giltwood marbletop occasional table. Oak court cabinet on high base. Fancy burlwood sewing table. Fancy studded leather storage box. Tripod tip table with commemorative inlay depicting Geo. and Martha Washington. Fancy oval marbletop occasional table. Good Clark’s spool cabinet. Small cabinets of drawers. Eight drawer mahogany dentist’s chest and early Electro dental office compressor. Fancy Hunzinger platform rocker. Fancy rattan, children’s and other Victorian ocnl. furniture. Rustic garden furniture and accessories. 42 X 28 in. Stickley library desk. Good 19th c. inlaid walnut carpenter’s chest. Five shapely 30 in. scrolled ARCHITECTURAL corbels in orig. finish. Four 18th c. interior doors from local house with orig. latches. 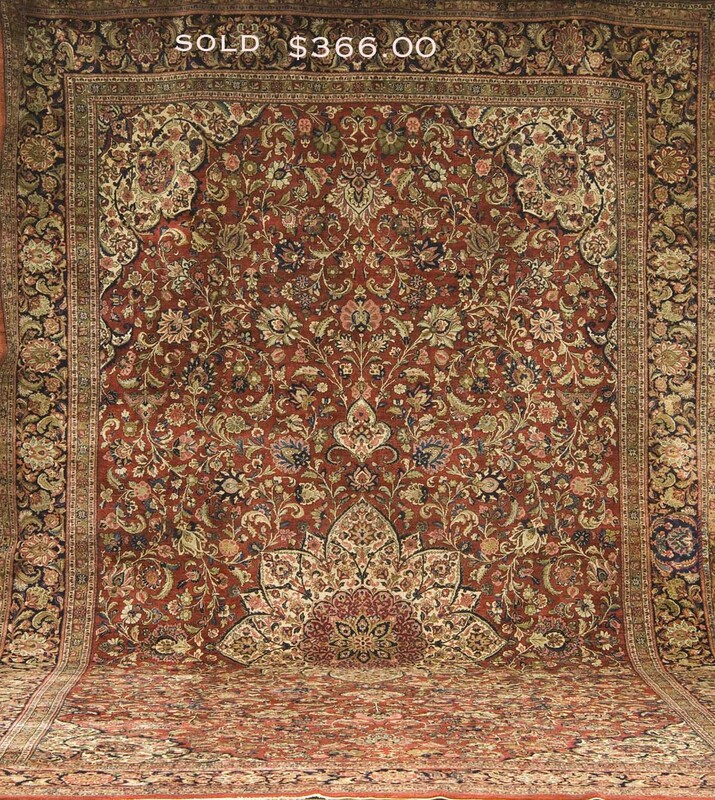 ORIENTAL RUGS: Room-sized carpets, including 13 X 20 ft. Kazvin. 7’10 X 10’2 Indian carpet with trees motif. 4’7 X 7’4 Kirman prayer rug with birds and figures. 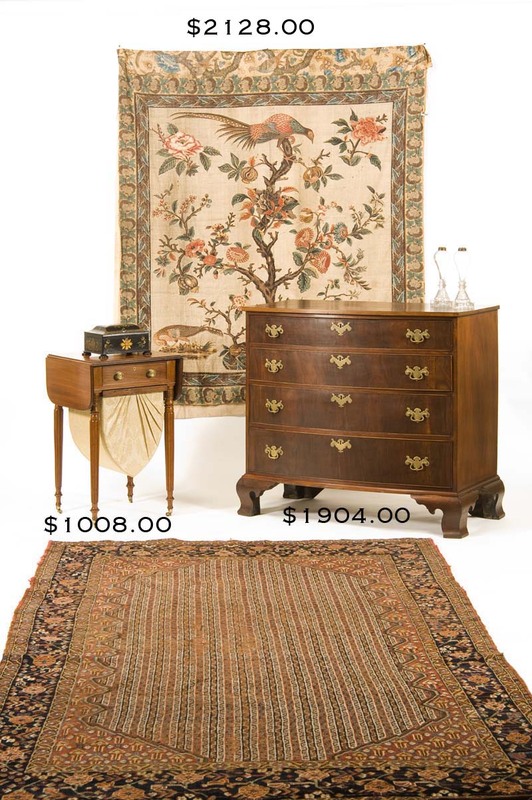 Other medium and smaller size rugs. OLD TEXTILES AND VINTAGE CLOTHING: Early 6 X 5 ft. chintz hanging with tree, floral and exotic bird motif. 42 X 16 in. 1753 floral embroidered silk panel. Good paisleys and paisley coat. Old lace, trims and sewing items. Graphic quilts and coverlets. Two vintage wedding dresses. Doll clothing and shoes. The top hat worn by William Emery Gardner, who was raised by Isabella Stuart Gardner. Misc. vintage clothing. Bearskin coats. OLD BUTTONS: Wide variety of collectible buttons from N.E. estates, arranged professionally in approximately twenty-five lots, including scenes, birds, heads, animals, florals, sports, mythology, oriental figures, fables, military, clear, black and colored glass, waistcoat, plastics and more. ACCESSORIES: Rare 29 in. Buddy “L” toy bus. 33 in. Sturditoy Water Tanker No. 9 fire truck. 14 in. diam. locomotive bell. Decorated stoneware. Nautical lighting and compasses. 19th c. 14 in. decorated American sailor’s busk. Carved bone, sword and 1889 gold presentation walking sticks. 18th c. skewer set from Roger Bacon’s kitchen. 17th to 19th c. brass candlesticks. Good figural brass shot flasks. Old desk accessories. Early European and oriental metalware. Collection of British, American and Arabic toy lead figures and military equipment. STEIFF 12 in teddy bear and 7 in. squirrel. 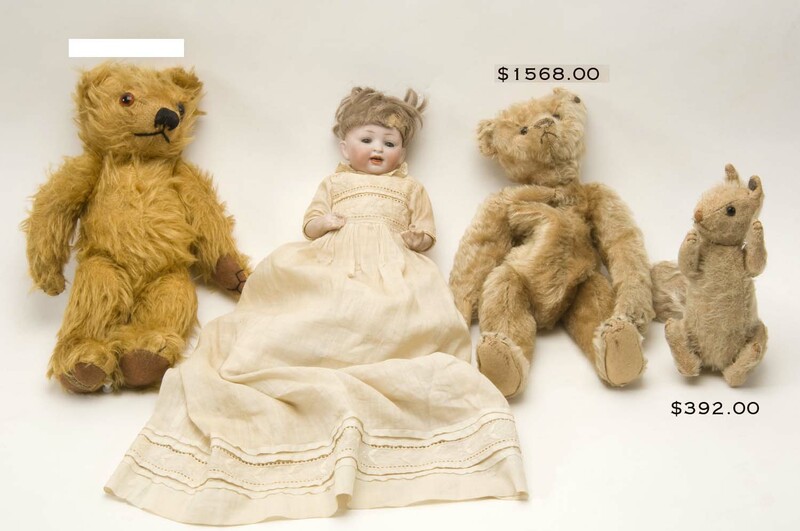 Other teddys. Bisque, cloth and wooden head dolls. Doll clothing and shoes. The best floral decorated toleware deed box. Lady’s oval wallpaper box. Hoyle’s gaming hand-held fan and others. Good early woodenware, pantry boxes and better baskets. Indian-made snowshoes and St. Lawrence River birchbark basket. Miniature 1832 watercolor memorial for Eliza. 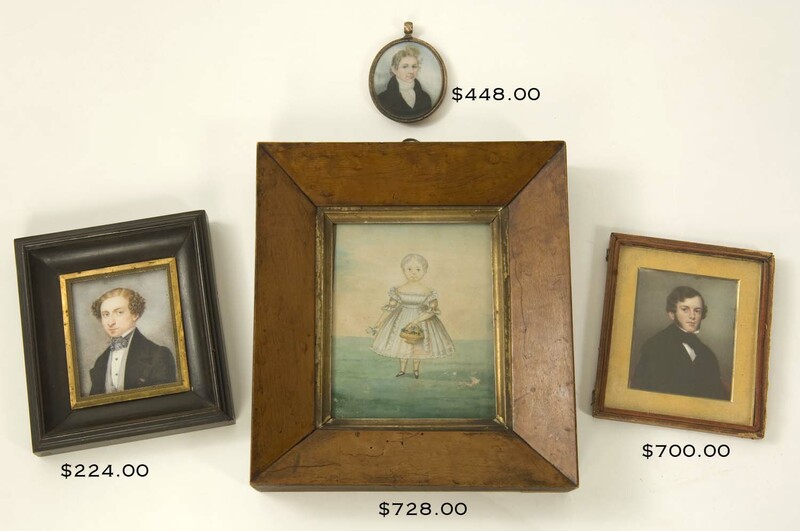 Good family portrait miniatures. Bracket and shelf clocks. Early 8 ft. wooden airplane propeller. WWII open cockpit aviator’s leather flight pants. Assortment of early woodworking tools from the early Trefethen family of Rye, NH. Another small tool box packed full. MUSICAL INSTRUMENTS: 19th c. hammer dulcimer in original distinctive feather-grained poplar case. Old mandolins and banjo. OLD LIGHTING: Ceiling mounted apothecary fixture from local drug store. 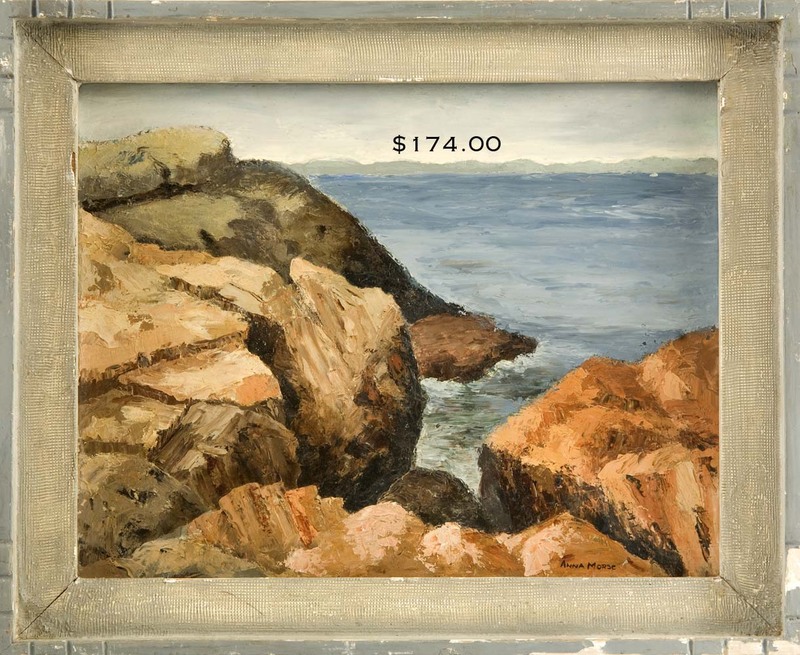 Catskill Falls and Thousand Isles motif lithopane shade. Arts and Crafts matte green metallic table lamp. Sandwich and other whale oils. Good crystal chandelier. Architectural and figural table lamps. ESTATE CHINA, GLASSWARE AND POTTERY: Selection of Dedham pottery in rabbit, turkey, duck and fruit motif. Rose Medallion and Canton serving pieces. 18 in. Imari charger. Rare 4 in. French majolica fish and mollusk plaque. Variegated painted fish dessert plates. Haviland Limoges. Royal Austrian berry set. Leeds openwork basket. 12 in. Satsuma genre decorated vase. Male/female Quimper figures. Yellow-ware and redware. Desideria decorated Southwest blackware vase. Early blown glass, including fluted mouth pitcher with applied nuts and leaves and early blown wines and tumblers. Squat Marblehead vase. Interesting art pottery and metalwork made by Arthur L. Morse (1883-1969), Lynn, MA. 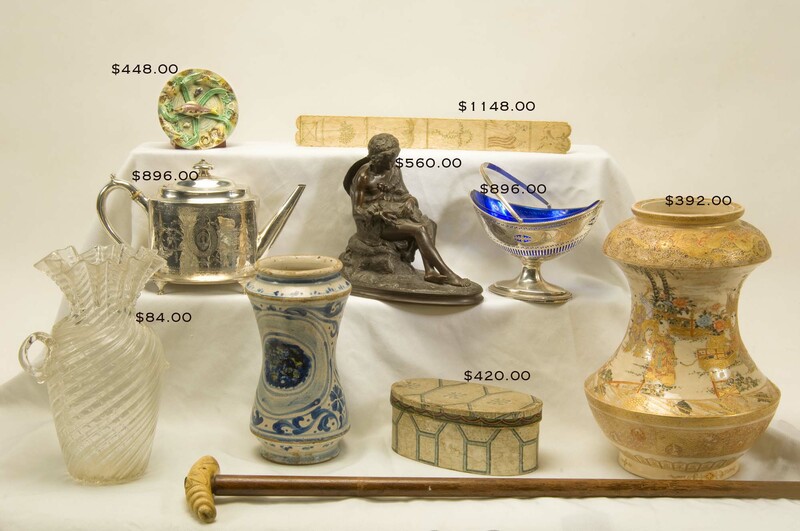 Good assortment of 19th c. decorative china and glassware. ESTATE JEWELRY: Gold, sterling and gemstone jewelry. Rare 14K chatelaine mesh purse. J. Anderton, London, pocketwatch. Fancy gold watches, incl. A. Golay, Dent (London), etc. 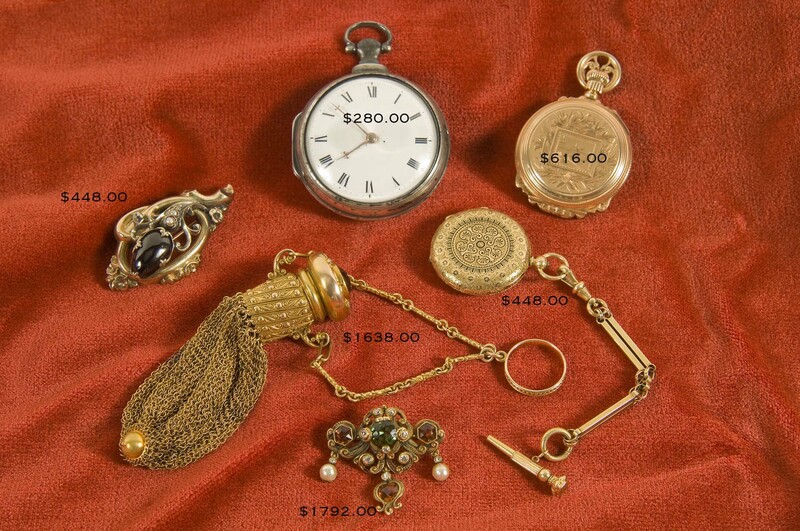 Good Victorian and later costume jewelry. Large selection of ESTATE SILVER. Peter and Jonathan Bateman teapot and undertray. Hester Bateman open basket. Tiffany service for six and other sets. Partial sets of good flatware and interesting serving utensils. Tea sets and hollow-ware. Candlesticks and accessories. OLD BOOKS, PAPER AND PHOTOGRAPHY: Diverse selection of estate books, including a great portion available to be made into minimum bid sale lots. Travel, architecture, Civil War, art, costumes, town and state histories, genealogies, fishing and outdoor sporting, good leather sets. Goodale/Sprague’s Wild Flowers of America. Varrell’s British Birds and other volumes on exotic birds and reptiles. Theo. Roosevelt signed African Game Trails. Rousselet’s L’Inde des Rajahs. George Sale’s The Koran. Lim. laid paper ed. of DeFoe’s Robinson Crusoe. Eaton’s Ferns of North America. 13th ed. of Encyclopedia Britannica. Celia Thaxter and Oscar Laighton books. Thaxter signed poem. Inscribed Gloria Swanson publicity photos. Lot of astronaut and movie star signed photos. Marlene Dietrich signed photo. 10-1/2 X 8-1/2 in. green glass advert. pane depicting front page of Scribner’s Fiction Number  August. Foldout 1826 Map of the New England States, Nathan Hale, Boston. 1837 So. 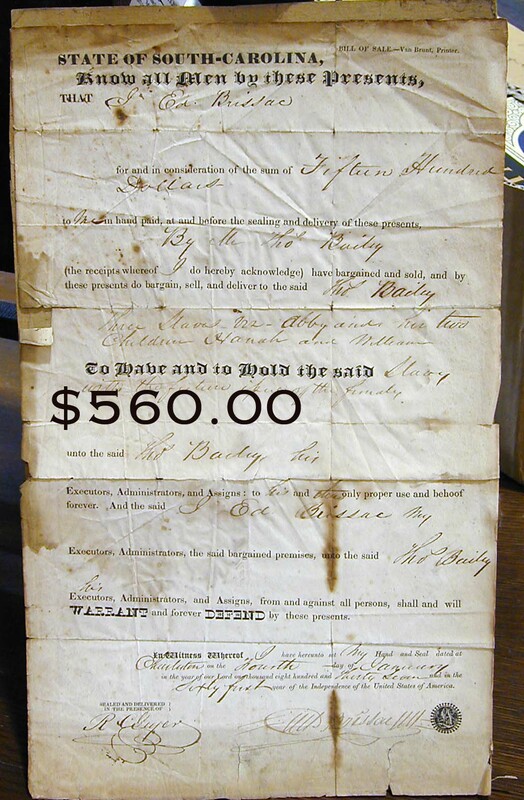 Carolina slave bill of sale. 1865 Reward broadside. 19th c. English architectural ads. Post cards and views. Old N.E. guides. Trade and scrap albums. 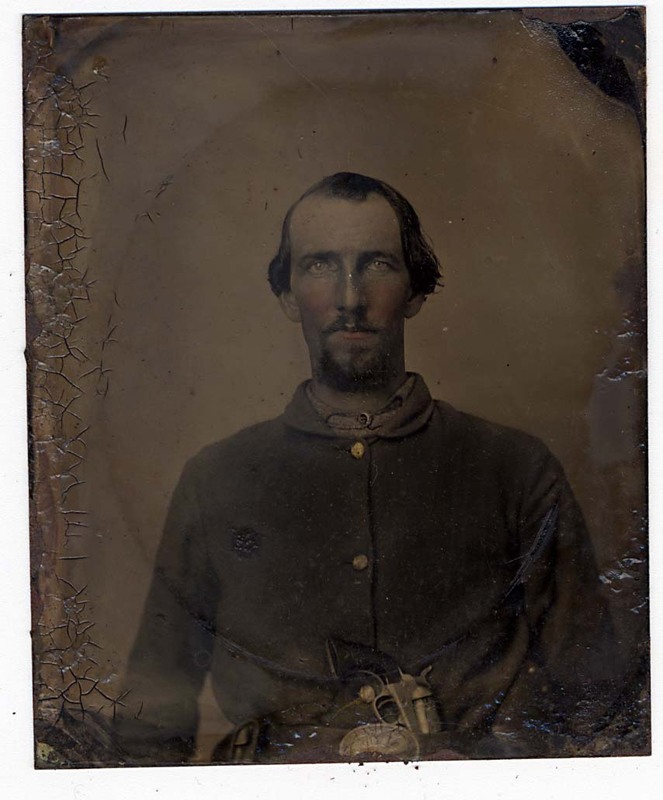 Rare tintype of Confederate soldier with sidearm (detail view). Tintype of woman with cat. C. 1900 (?) paper photos of outdoor mining scenes. Early Portland, ME photos. Large framed photo of 1904 LA Purchase Exposition at St. Louis World’s Fair. Old family snap albums. OLD PAINTINGS , PRINTS AND SCULPTURE: 69 X 57-1/2 in. 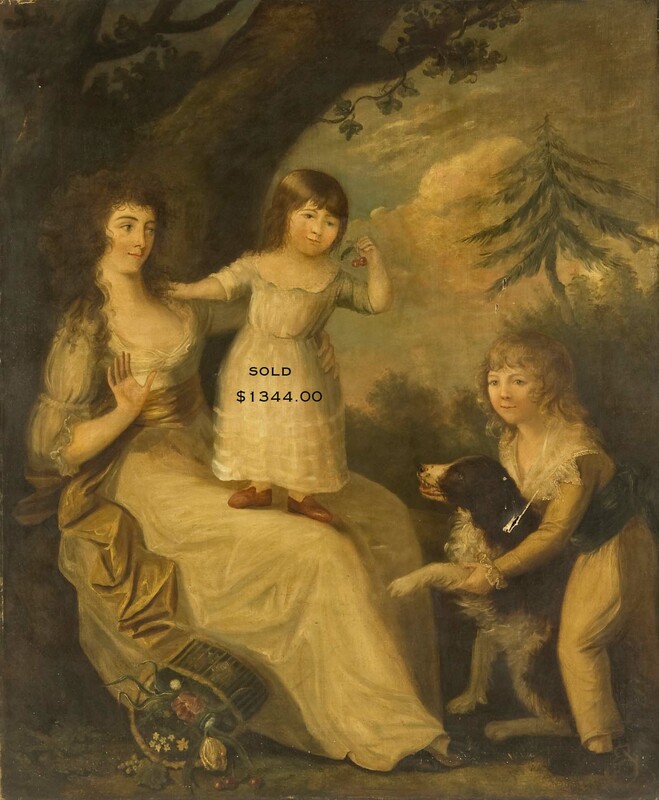 unframed 18th c. English or Continental oil of a cheerful mother and children with dog. 7-1/2 X 12-1/2 in. Thomas Clark Oliver seascape oil with American ships. P. Baumgras, 1900, small woodland river oil. 23-1/2 X 19-1/2 in. 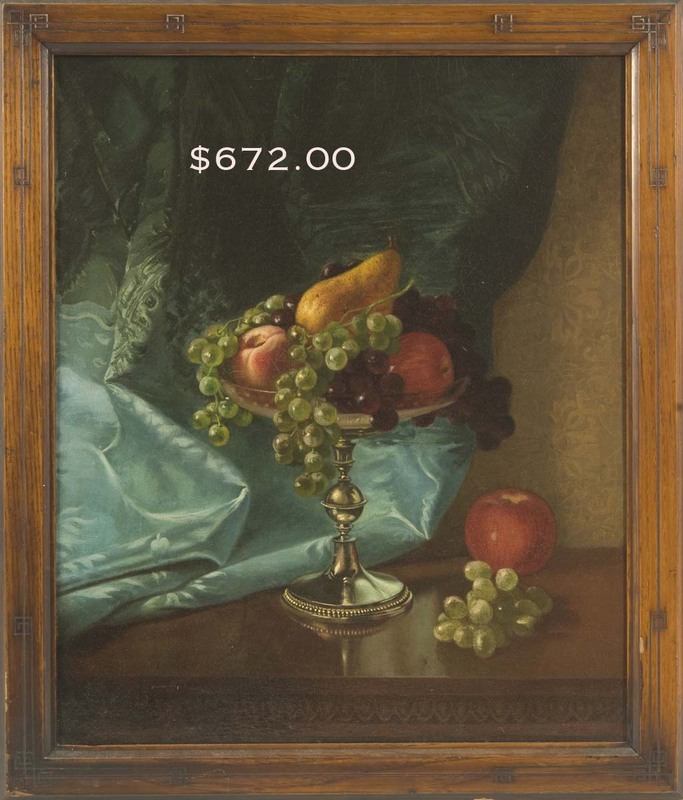 S.C. (Sylvia) Stetson fruit still life oil. 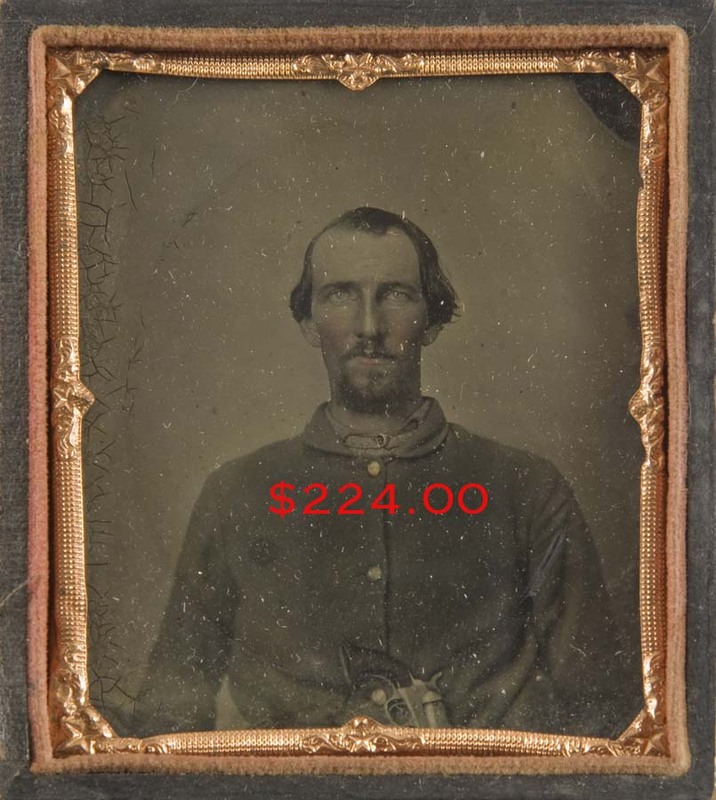 Numerous good portrait miniatures. (more miniature portraits 1, 2 ) 27- X 23-1/2 in. 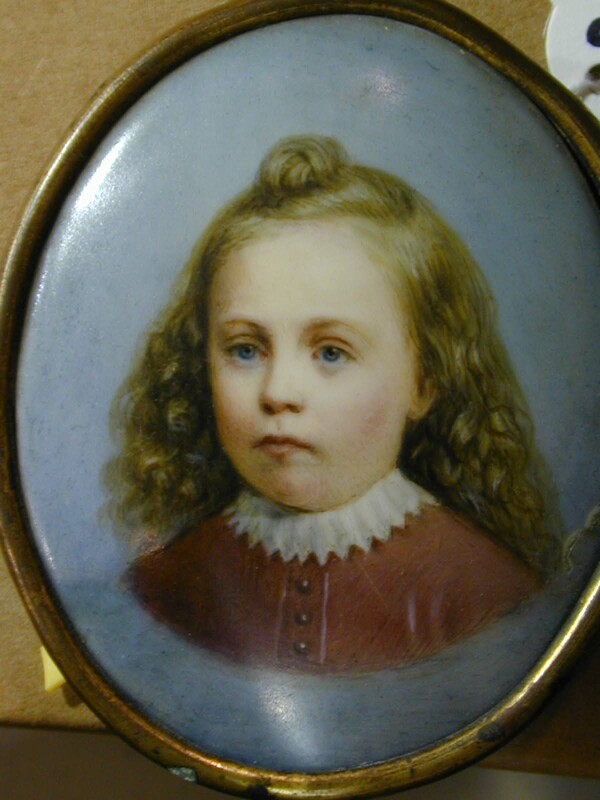 19th c. oil portrait of Sybil Victoria Hoyt of Manchester, NH. Good 25 X 22 in. 19th c. oil portrait of smiling young gentleman. 29 1/2 X 24 1/2 in. oil portrait of young woman holding a book. Color tinted silhouette of little girl. 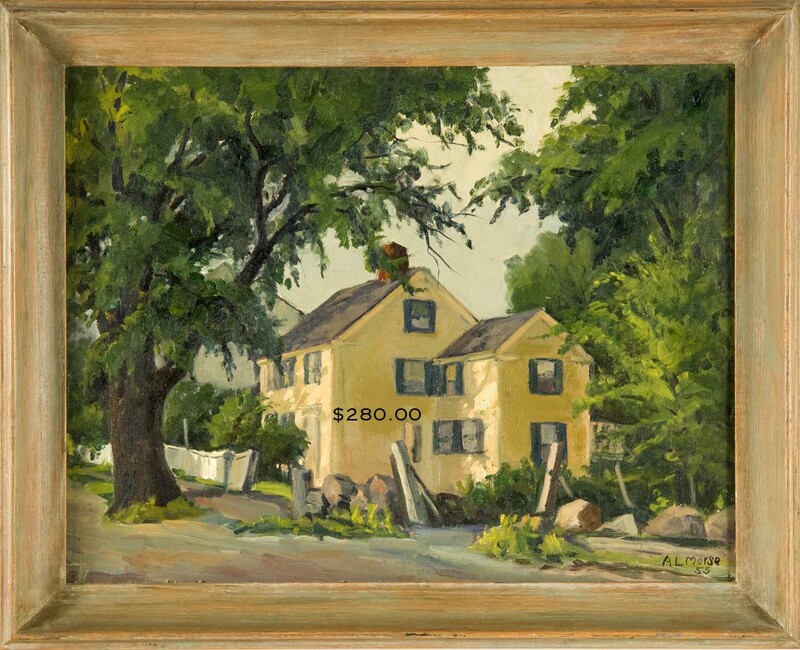 Selection of well-executed Lynn and Swamscott, MA area oil seascapes, landscapes and other works by Arthur L. Morse, Anna Morse and Charles Ovid Morse. Wm. Cary India ink of birchbark canoers. 20 X 26 in. gouache of rooftop neighborhood view. Large Rita Cote local landscape oil. 8-1/2 in. J. Salmson bronze of boy holding dog. Plaster bust of Sir Walter Scott. Large folio Audubon Orange Colored Mouse. Small Audubon bird bookplates. Gould’s Perdix Chukar. H.E. Tuttle bird etching. Early engravings of Italian architecture and The Louvre. Other decorative paintings and prints. 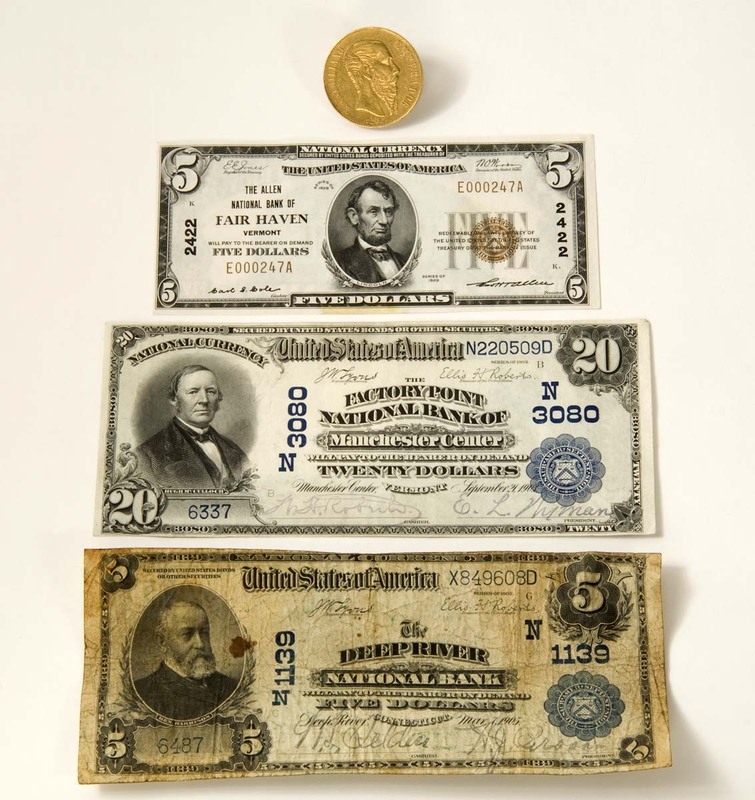 TERMS OF SALE: Cash or check approved by auctioneer. Mastercard and Visa accepted. Twelve percent Buyer’s Premium. Five percent ME Sales Tax applies to all purchases without a copy of a current resale exemption certificate. Written or oral descriptions subject to error or omission. Physical inspection of individual sale lots is encouraged. Absentee bids accepted until 9:30 a.m. on auction day. Sale expertly catered by Through the Grapevine, Eliot, ME.